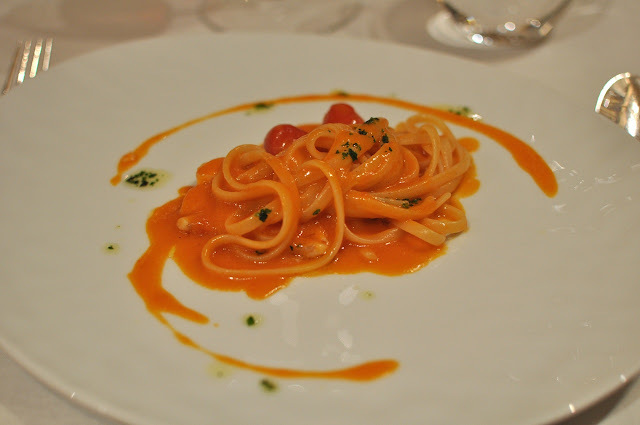 Dal Pescatore is a 3-Michelin star Italian restaurant located literally in the middle of nowhere. 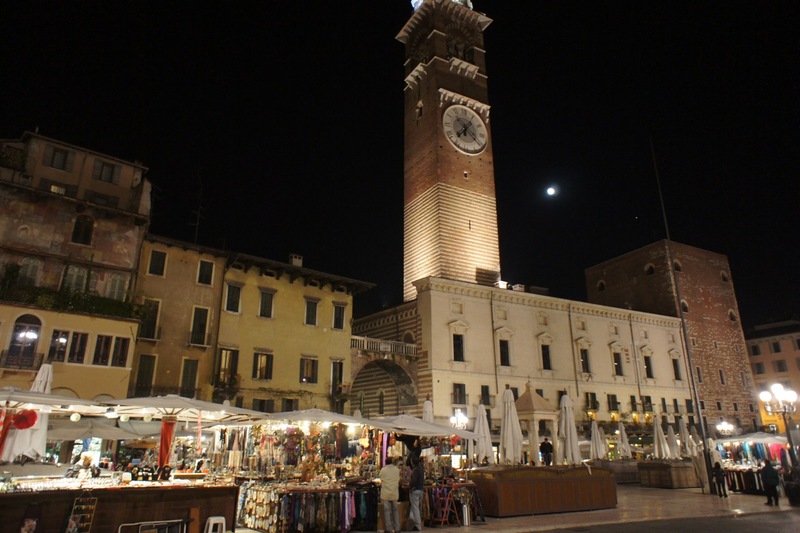 It's a minimum of an hour's drive from any big city (we drove from Verona and it took nearly 90 minutes) and is in a small hamlet which apparently has a total population of over 30 people. Our GPS got us to the hamlet fine, but then we could not initially find the restaurant, though as we drove past a row of houses we could see into a window which had a group of very seriously dressed chefs in a modern kitchen. Thinking that it must be the restaurant, we looked out for the entrance, and eventually managed to locate the closed gate at the side of the row of houses. Apparently, they only open at 8pm (our reservation was at 8pm) and before then, the main gate would be closed. Fortunately, we stopped our car in front of the gate long enough for them to decide to let us in (it was 7.30pm and we were early as we had budgeted more time to get there in case we got lost). 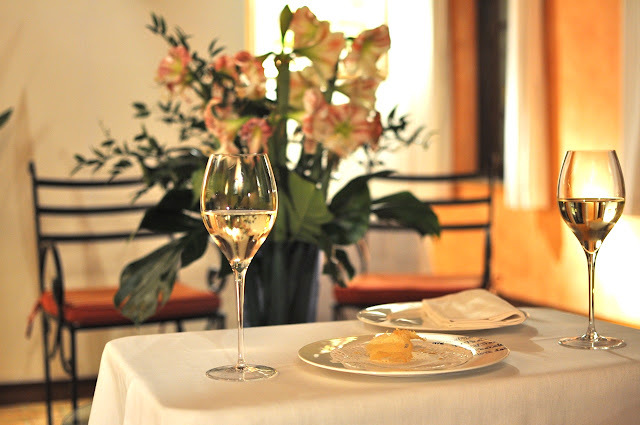 After we had parked the car, we were let into the house by a member of the staff, who led us into a sitting room and served us with some prosecco and very delicious parmesan crisps, while waiting for our table which was only open at 8pm. Promptly at 8pm, we were ushered into the very tasteful and elegant dining room, which had a lit open fireplace. The tables here were big and widely-spaced, and we were seated next to the glass sliding doors on the other side of which is the courtyard and outdoor dining area during warmer evenings. 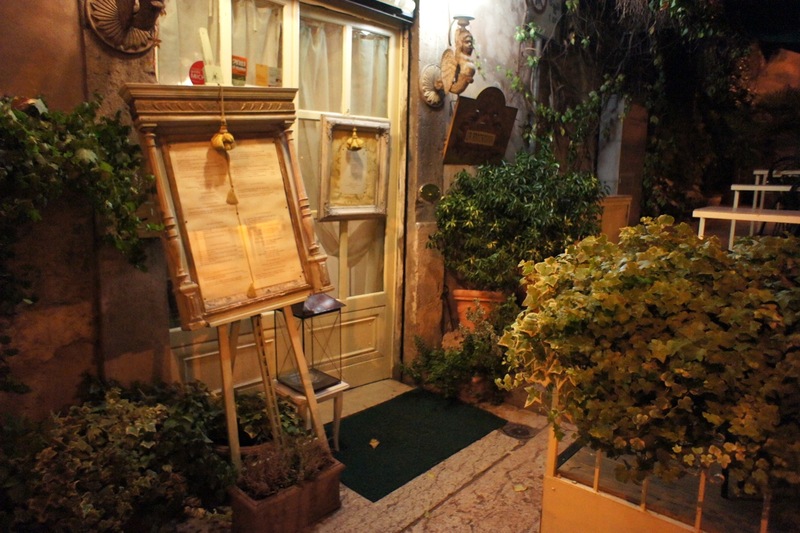 The restaurant has two resident dogs (a german shepherd and a golden retriever) who were allowed to run freely in the courtyard. We were given the wine list which was a large tome with a very good selection, however, there were several notable wines which had significant mark-ups. 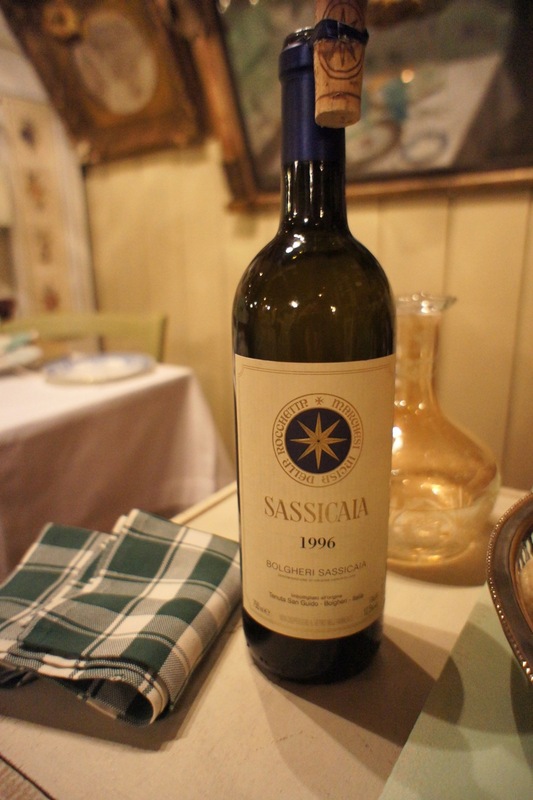 For example, I spotted the 1996 Sassicaia which was 3 times the cost of what we paid for it the night before in another restaurant. Nevertheless, we were able to identify some good wines which were priced more reasonably (the markups on the barolos were significantly less than that on the supertuscans), and we chose the 2001 Luciano Sandrone Le Vigne Barolo in the end. This was a vintage which was drinking very well, and though we had an open bottle of the 2000 vintage of the same wine in the hotel (which I opened earlier that day), we felt that the 2001 was a better wine. For dinner, we opted for different menus. My wife chose the Menu D'Autunno (Autumn Menu) and I went for the Menu dalla Campagna (Countryside menu - i.e. the classics). 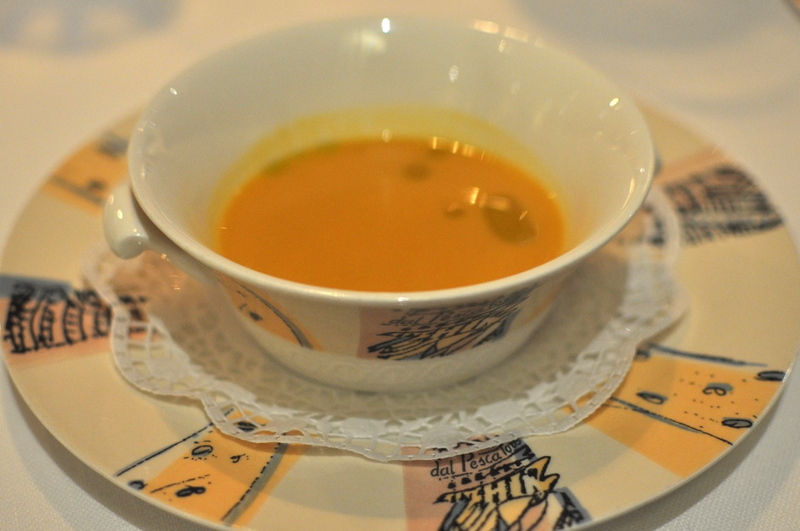 Amuse bouche was a simply done but quite delicious pumpkin soup with extra virgin olive oil. 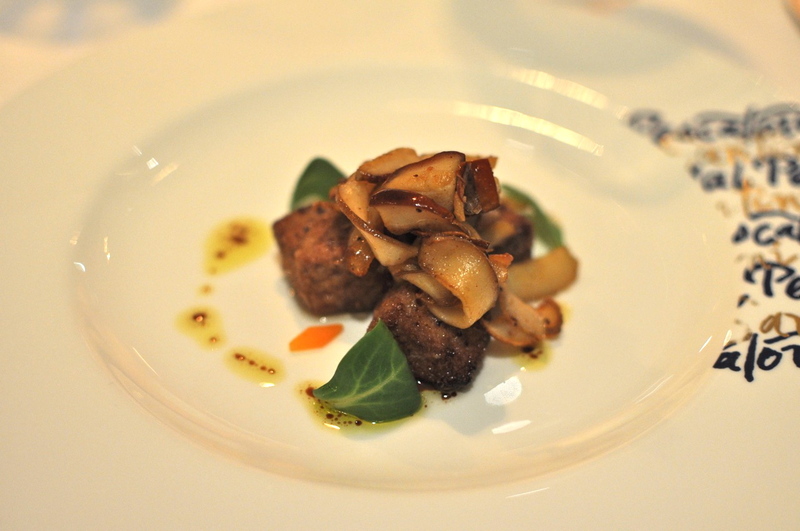 For our first course, I had the artichokes and veal liver with butter and rosemary. 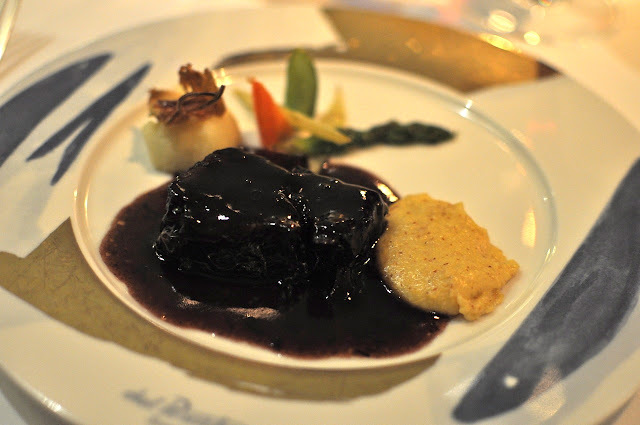 I thought it was an excellent dish and really enjoyed the liver (I usually don't like liver done this way). The artichokes really balanced out the liver and toned down its otherwise gamey taste. 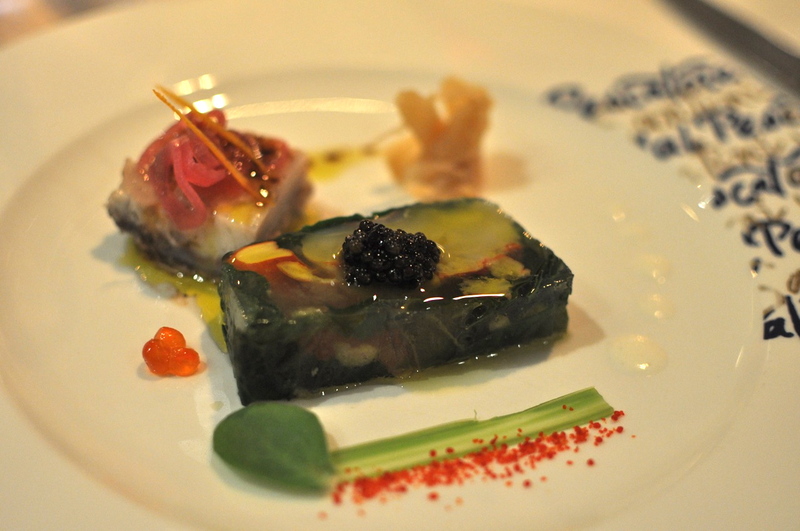 My wife had the Sardinia blue lobster in champagne jelly, royal baeri caviar and marinated eel. She thought that this was very good. Next, I was supposed to get the tortelli of Lucca with macaroons, mustard and parmesan cheese, whereas my wife was to get the Muscovy duck ravioli with asparagus and cherry tomato confit. We had asked the waiter to see if they could split the portions between us so that we could have some variety, but they very kindly gave us each a full portion of each instead. 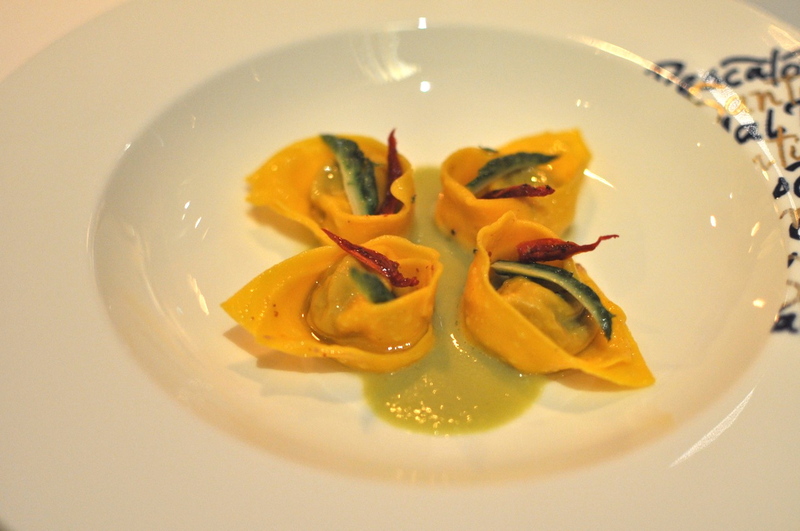 The duck ravioli was sublime, as there was a sweetness to it from the tomato confit. 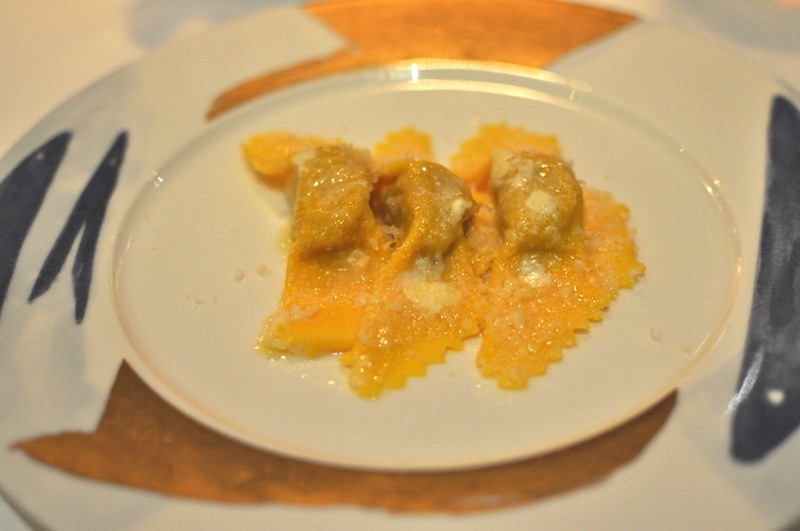 The tortelli was also quite good but at that point, eating 6 large raviolis/tortellis was filling us up very quickly. It was after this that the meal started going downhill. 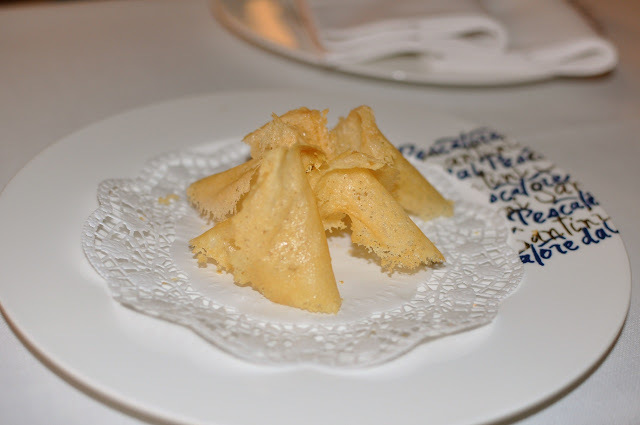 The next dish was the triangular pasta stuffed with burrata cheese from Puglia and parmesan cheese, which I thought was quite tasteless and ordinary, and my wife had the saffron risotto with balsamic vinegar, which was good but she found it too heavy. At this point we also started to get annoyed with the staff. 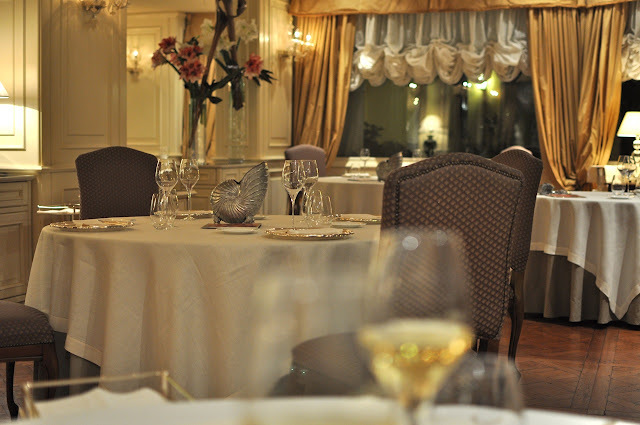 The staff members who were serving in the room (there was a total of 4 tables taken that night, each with 2 guests each; hence it was not a busy night) were stiff and quite condescending, we felt. In particular, the sommelier, who was Japanese, was particularly annoying and wasn't helpful with the wine list. Worse, in hindsight (we were given a copy of the menu when we left and went through it to recollect what we had eaten), the waiters got our orders mixed up for this course. I was supposed to get the risotto and my wife the triangular pasta. Quite unacceptable for a restaurant of this standard. 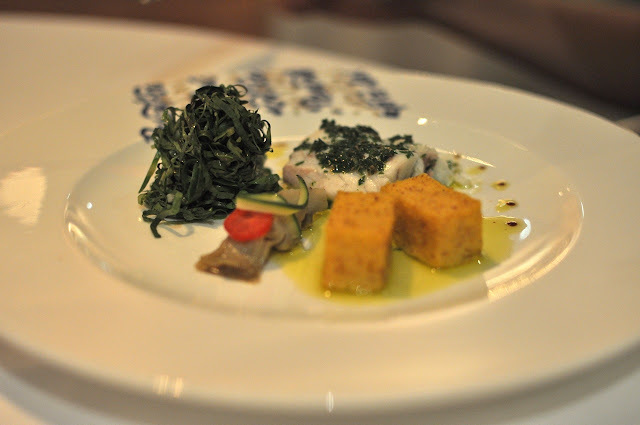 For the fish dish, I had the turbot cooked in salt and extra virgin olive oil with anchovies, capers and parsley. 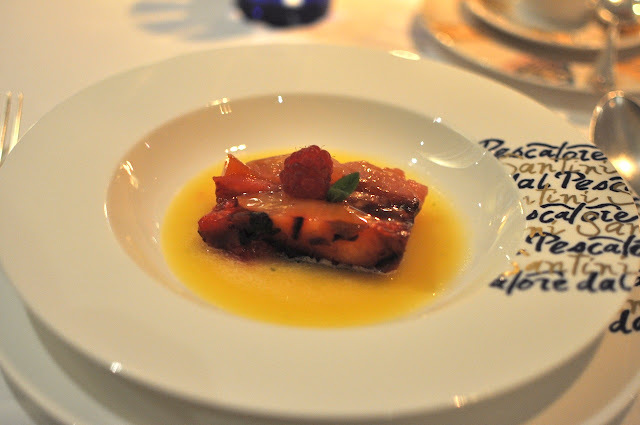 I thought this was very unremarkable, and it was nowhere near as good as the turbot dishes we've had in Paris. In fact, it could have been any other white fish and I wouldn't have been able to tell the difference as the dish did not manage to bring out the texture of the turbot. 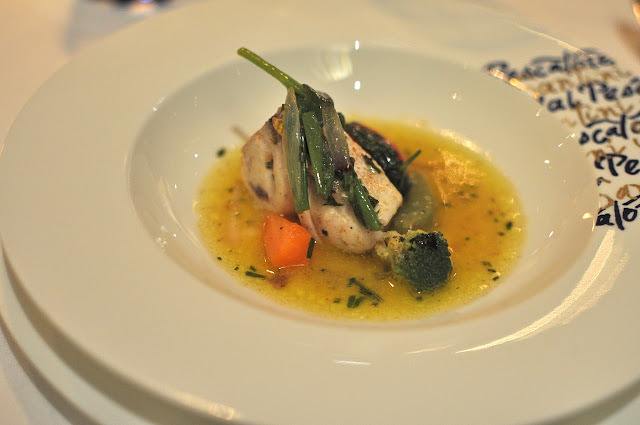 My wife had the sea bass stewed with seasonal vegetables, chili pepper and extra virgin olive oil. 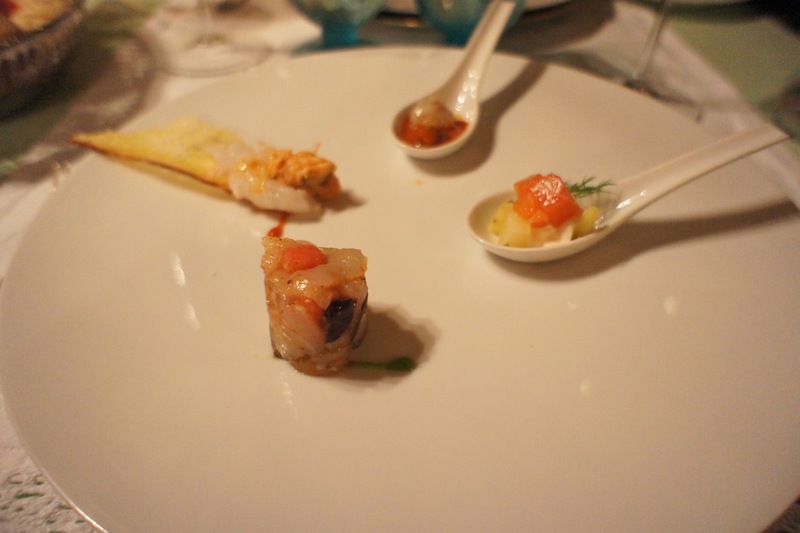 The sea bass was not bad, but she did not like the polenta or the pickled seasonal vegetables. 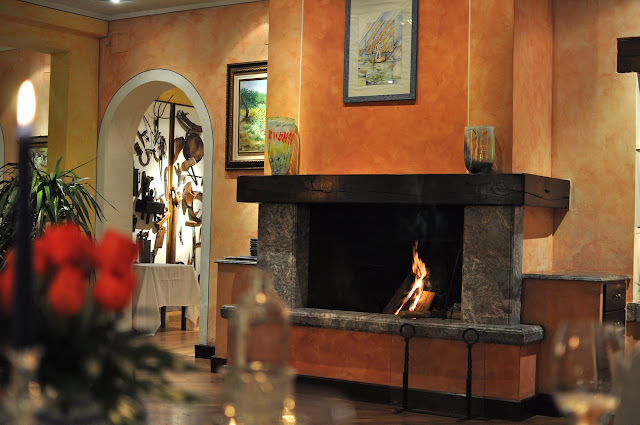 Given that 'dal pescatore' means 'the fisherman' in Italian, we expected more from the chef in respect of the fish dishes. 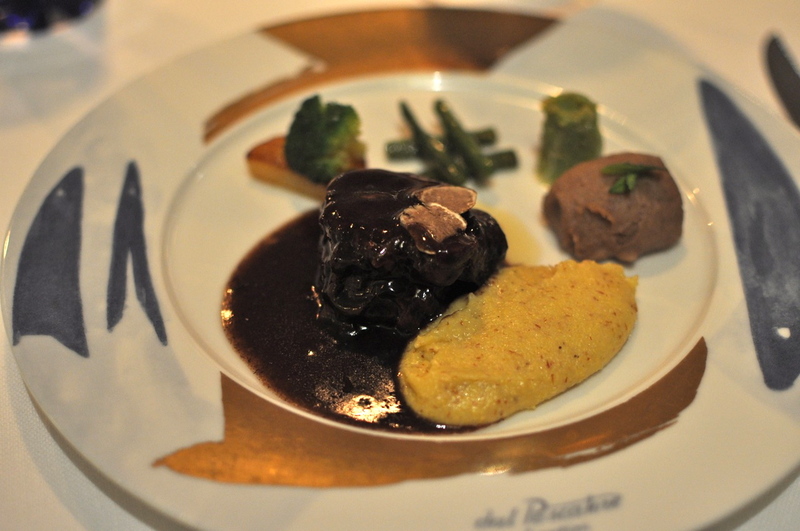 For the red meat dishes, I had the beef with red wine sauce and polenta, which was very good and tender, though I thought the sauce (which was very rich) was a little too overpowering. My wife had the wild hare with chestnut mash, which was also very good, but again, the sauce was too much. These two dishes lacked subtlety. 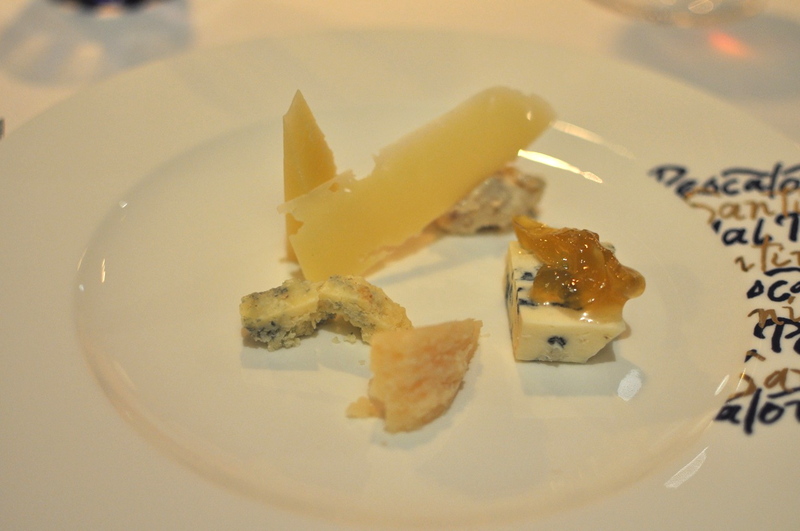 We had an interlude of cheese before dessert, which was quite good as it was a diverse selection of different cheeses, followed by a petit four tray. 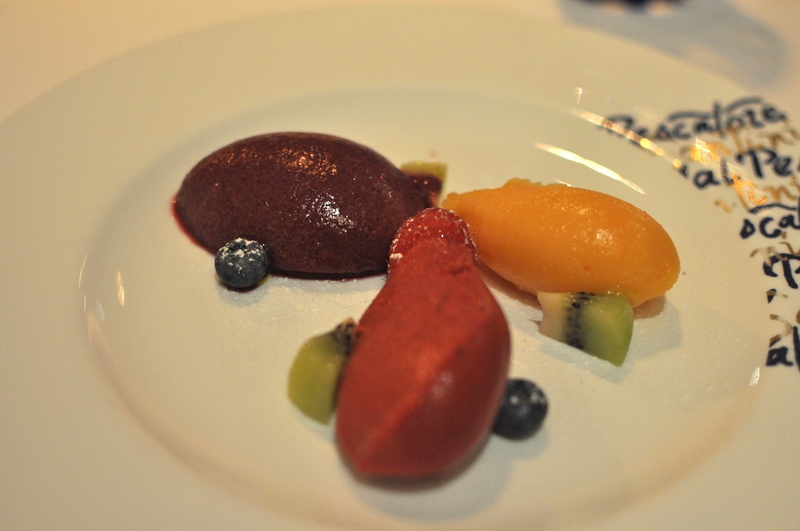 For dessert, I had the sorbet of 3 different fruits, which was very good and refreshing after the heavy meal, and my wife had a berry terrine which was quite good as well. We came to this restaurant with very high hopes and have been looking forward to this meal for over a year. 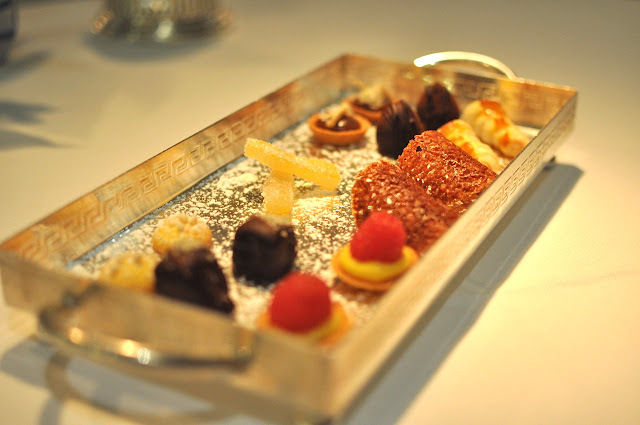 However, though the food was good and the dining room ambience quite special, there was nothing in the menu which was particularly memorable. The kind of service we got that night could have been understandable (if less than perfect service is understandable in a 3-star restaurant; the french would have cried bloody murder) if we were in a big city and this was a high-society place (granted, they did have a helipad next to the restaurant which gave a hint of the kind of guests they get sometimes), however, this was a barn house in the middle of nowhere and they should really have given a bit more credit to guests who bothered to drive all the way out to look for it. On their website and on several other reviews we read about this, much has been made about how this is a family restaurant etc. but that wasn't the experience we had during this visit. 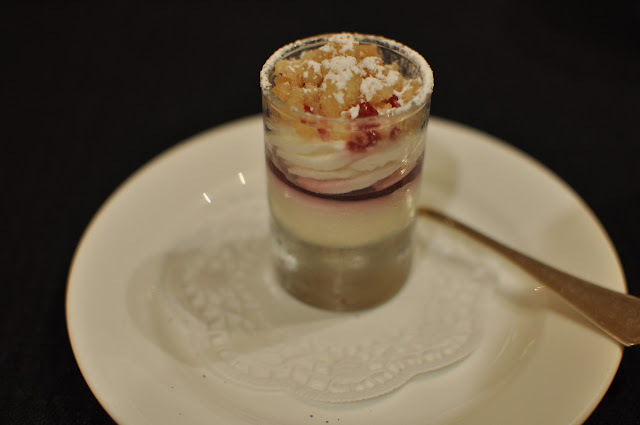 Final Thoughts: The food was very refined yet some of the dishes lacked flair. We suspected that Chef Nadia Santini (who has such a stellar reputation) was not in the kitchen that night, as overall the food didn't meet our expectations (which were sky-high after reading countless reviews raving about this restaurant). Nonetheless, it was a very nice dining room, spacious and warm. Service that night was appalling, we felt. The waiters were condescending and stiff and made us feel watched all night, and not in a good way. At the end of the dinner, Antonio Santini came out to say hi to us but it felt orchestrated. For a restaurant which prided itself on being a family-run restaurant, we did not feel any genuineness in their hospitality that night. 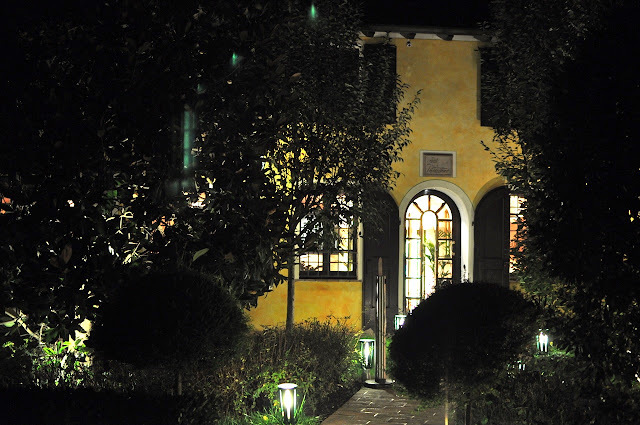 La Fontanina is a 1-Michelin star Italian restaurant in the historic city of Verona in Italy. Locating it can be quite difficult as there are conflicting sources for its location. 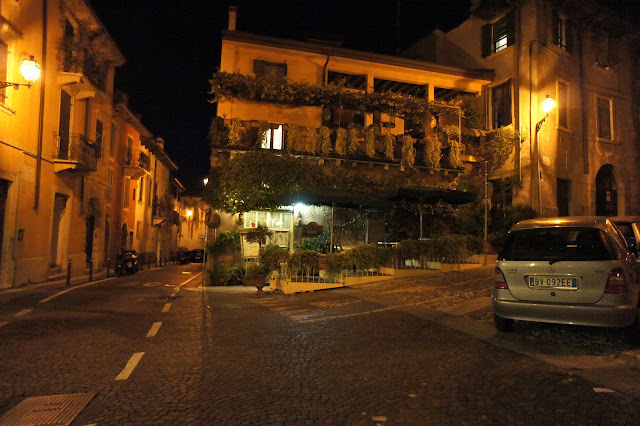 We had followed Google Maps and Blackberry Maps but could not find it, instead, the correct location is pinpointed on the restaurant's own website: It is near the Ponte Pietra bridge across the river from the old town. After walking around for quite a while, we finally managed to find it, in a quiet uphill small street off the main road. The exterior of the restaurant looks like a traditional inn, and was not what we expected of a fine-dining restaurant. 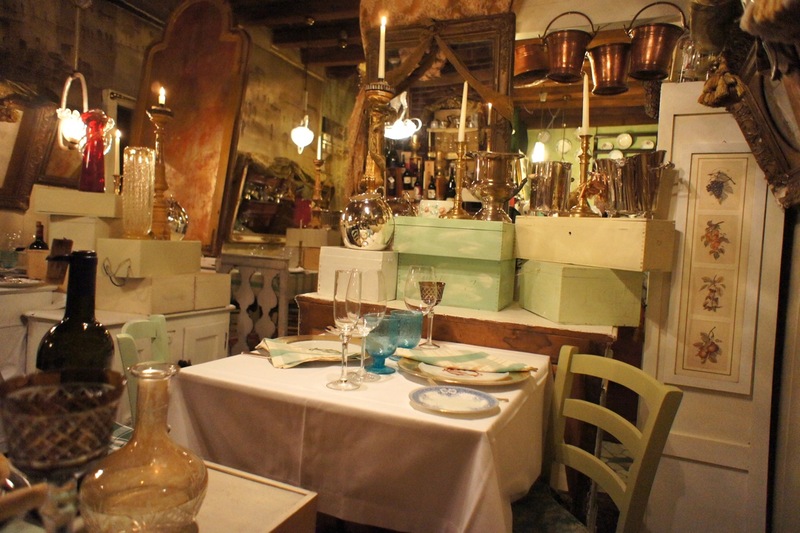 Stepping inside the restaurant, it was as if we were transported into another world. It was like a cross between someone's old musty wine cellar and the set of Carnivale (I was half expecting to be greeted by the bearded lady or an old elf). There wasn't a proper dining room, rather, it was a collection of nooks and crannies where diners were put, surrounded by crates, boxes, old candlesticks, copper buckets, decanters of all shapes and sizes and bottles of wines. I read a review earlier by someone who commented that La Fontanina was a 'temple for wines' and at that moment I understood the literal meaning of that. We were given a cozy corner table which was quite rickety (not what you'd expect at a Michelin star restaurant). 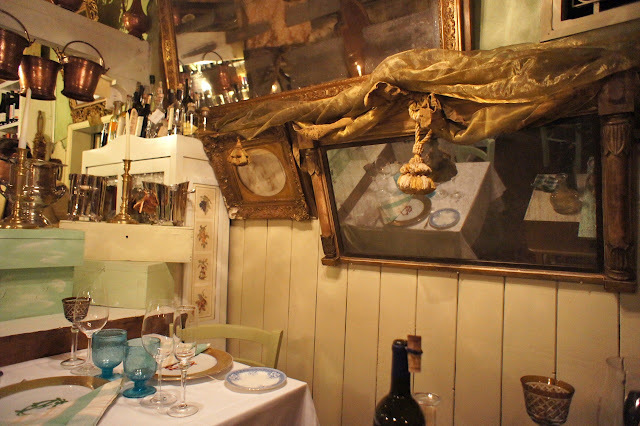 Yet for all its idiosyncrasies, it was truly a very interesting restaurant with an eclectic deco; we had never dined at a restaurant like this and we were very entertained by it. The service here was also very homely and warm. Throughout the night we were served by a very nice lady (who we presumed was one of the owners). 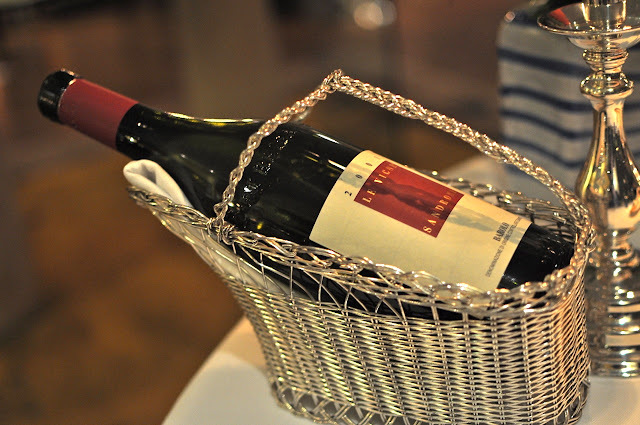 One of the astounding things about this restaurant was the quality of its wine list. 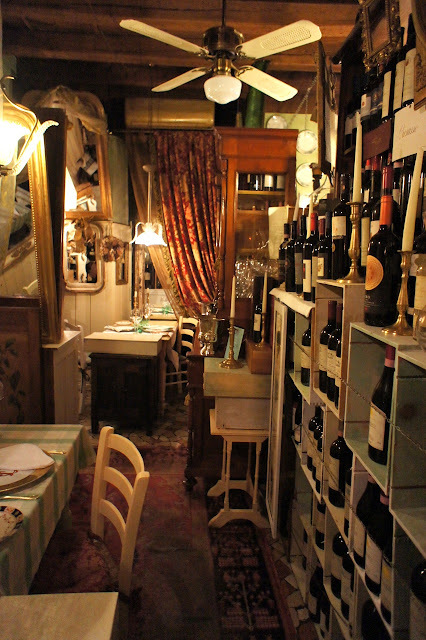 It had a wide selection of Italian wines, especially the older vintages, and all at very good prices. In the end, after mulling over a few different supertuscans, we narrowed it down to the 1996 or 1997 Sassicaia (both of which vintages we had always wanted to try). The 1997 was supposedly the better vintage overall, but the lady owner strongly recommended the 1996 which was also a very good year but was 3/4 the price of the 1997. These 2 vintages of this wine are hard enough to find in any restaurant, let alone at the price we were paying. It was a decision we would not regret, and it turned out to be one of the best wines we'd had this year. Having been absolutely stuffed the night before at Da Vittorio, we decided that we wanted a lighter dinner this time, and hence ordered the seafood menu. Amuse bouche was served first, and it was a selection of bites which included sea bass tartar, raw shrimp from sicily and raw salmon with potato; so far so good, in particular the shrimp and the sea bass. 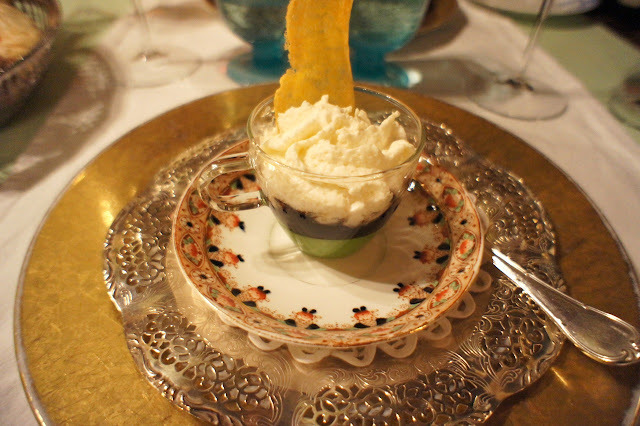 First course was the cappuccino of pea veloute, squid ink with squid, potato foam and potenta crisp. This was quite amazing. The potato foam tasted as light as whipped cream, and the cold pea veloute was a natural base for the warm and savoury squid ink in between. And all this was served on some really intricate tableware. 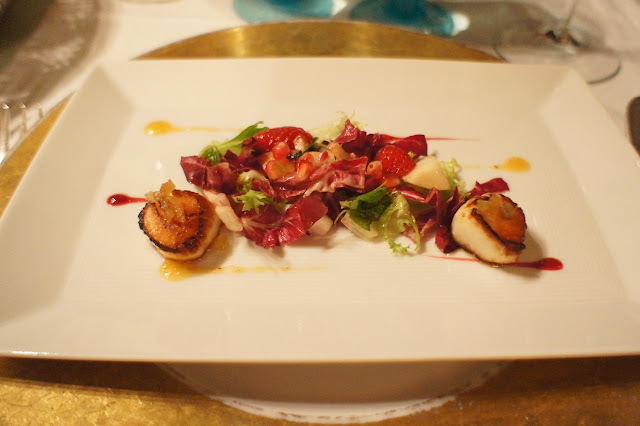 Next was the seared scallops with nicoise salad with strawberries, pomegranate, ginger and peach. It was a perfect balance of the ingredients of varying flavours; an excellent dish. This was followed by an interesting seared tuna with capers and olives, a tuna sandwich with tomato bread and burrata cheese and a spritzer alcohol foam to be drunk with a straw. 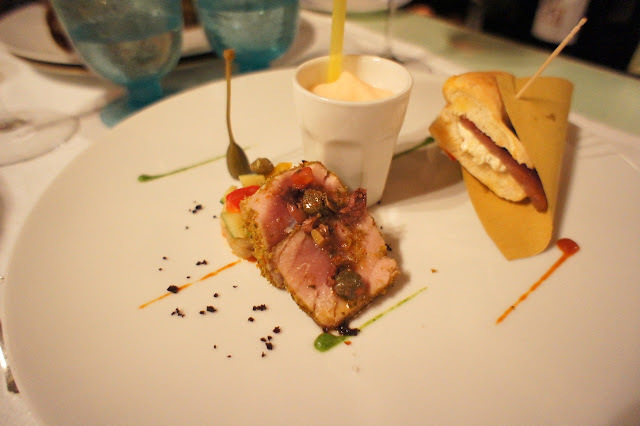 I was not a big fan of the seared tuna (it's very hard to get tuna right by doing it this way) but the sandwich was very good, as the burrata cheese (being very light and refreshing in taste) gave it some sophistication. 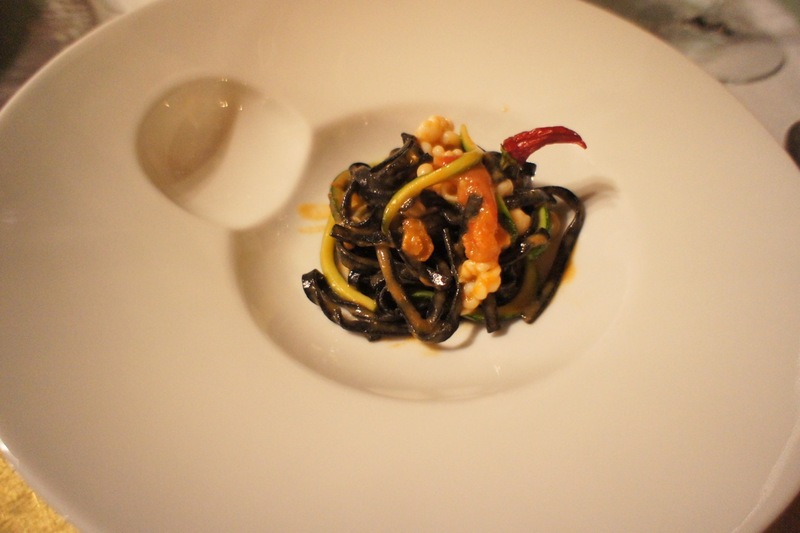 Pasta was the black ink tagliolini with zucchini, calamari and red pepper. I quite liked this dish, though my wife did not quite take to the tangy flavour and did not manage to finish it. 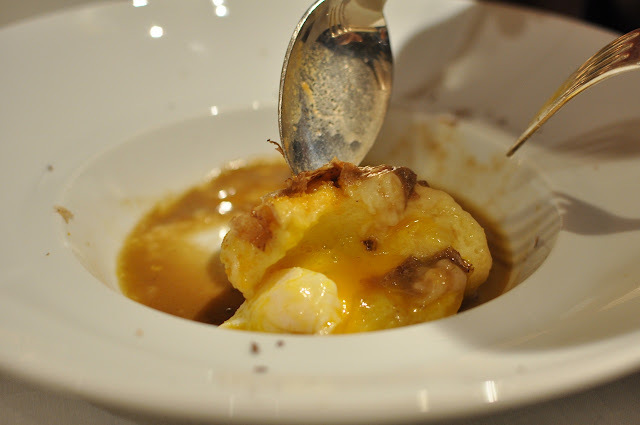 The main course was finished with the angler fish in bouillabaisse sauce with squid, prawns and mussels. 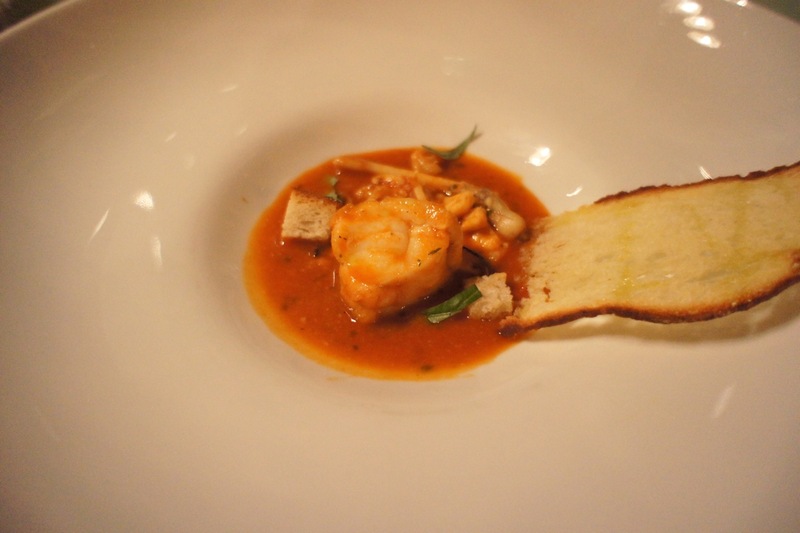 This was very good, and tasted like a thick piece of lobster in a lobster bisque soup (but much richer in taste). Petit four was a tray of panna cotta, chocolate mousse and some cookies, which were good, but the meal really ended well with the dessert of mango with papaya soup and pineapple sorbet which was a very refreshing and well put together. A word on the city of Verona: this is an ancient city, with stone and brick buildings dating back several eras and cobblestone roads and pavements. Walking in this city at night, even as early as 8pm but especially after midnight (when we were walking back to the hotel from dinner), many of the streets were dimly-lit, deathly quiet and deserted, and all the windows are closed or boarded up, giving us the feeling like we were the only people out there in the town. It was eerie, but at no time did we feel unsafe, as there didn't seem to be anyone around for us to feel unsafe about. 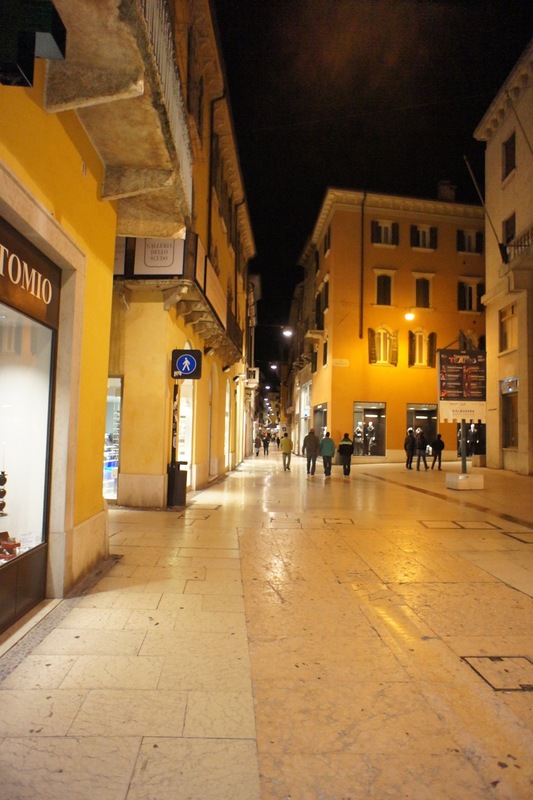 There was relatively more activity along the main squares or at the 'High Street', where the cobblestone road is replaced with a marble slab pavement, and the street is brightly lit and surrounded by modern stores; walking down this street late at night is an unreal experience; it feels like you are in a movie set with all that artificial lighting. This is a picturesque city, especially at night, although it is very small and one could probably see all of it within a day. 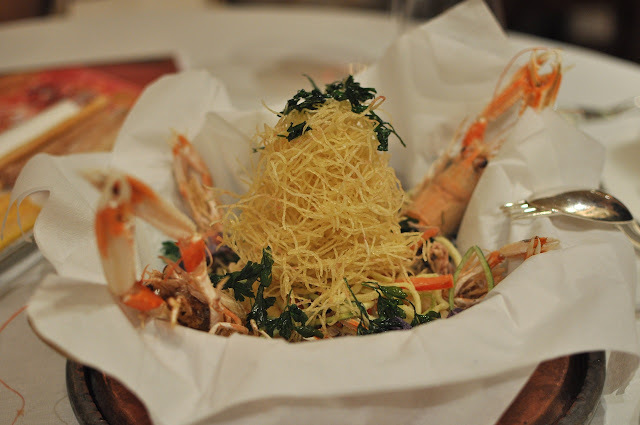 Food: Very innovative seafood menu, my wife felt that the food was too rich though, especially with the heavy use of olives. On our second day at Da Vittorio (see earlier review: Da Vittorio - first day, we took a walk around the compound and came across the enclosed lake area where about 2 dozen ducks, geese and swans resided. These birds were really peculiar. We expected them to be frightened of us, but instead, seeing us at the fence at one end, they then proceed to all come over. 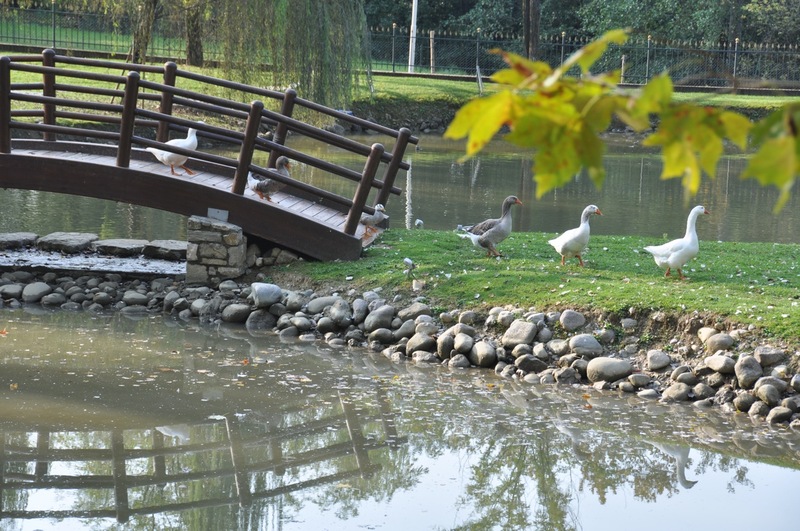 One particular group hilariously marched, single file with almost military precision, over the wooden bridge from one end of the pond to the other, to come across to where we were (picture below). We were there for 3 minutes and suddenly we were confronted by 20 birds right in front of us all looking expectantly. The thought did cross our minds: were these birds reared by the resort as pets or as livestock for the kitchen? For our second dinner at Da Vittorio, we opted to try their white truffle menu, as it was white truffle season. 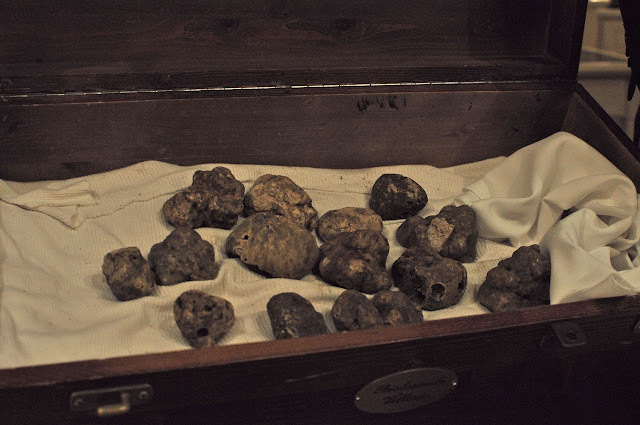 The restaurant was quite eagerly pushing this menu, and brought to our table their white truffle haul in an old chest to entice us. If we were only having one dinner at this restaurant, we would have gone for their normal menu instead (so as to get a good sense of the food in the restaurant - truffles can always make a chef look good), but seeing as we had tried their seafood menu the previous night, trying the truffle menu seemed like a good idea. 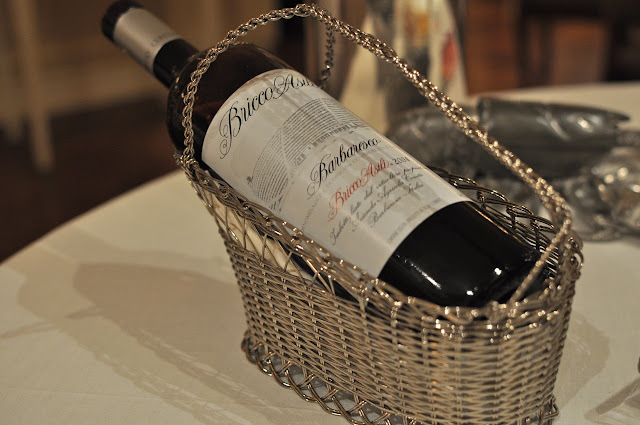 This time, we ordered a bottle of 2004 Bricco Asli Barbaresco from Ceretto. This turned out to be an excellent recommendation by the sommelier as it was a rich and complex wine, without being too tannic or heavy. 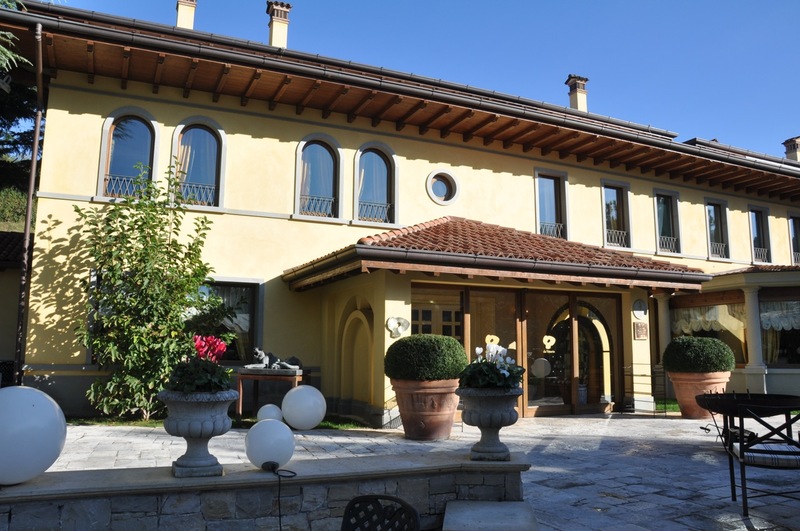 The Ceretto was also a Piedmont wine producer I had always wanted to try so this was a good introduction for us to this producer. The chef, being aware that it was our second consecutive dinner at his restaurant, had to come up with a different amuse bouche for us (every other table was having the same amuse bouche we had the night before). 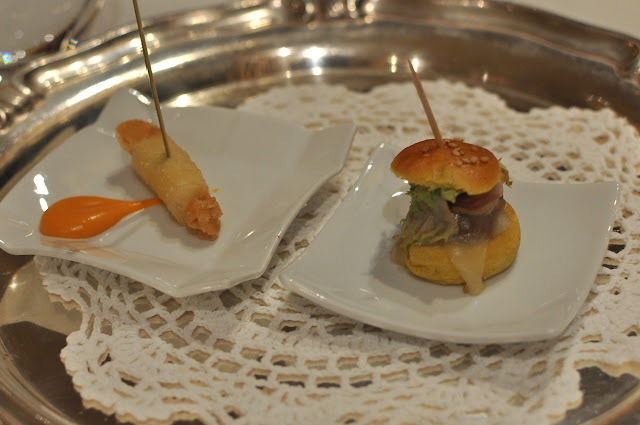 This time, it was an excellent mini burger with cheese and bacon, as well as a parmesan roll. 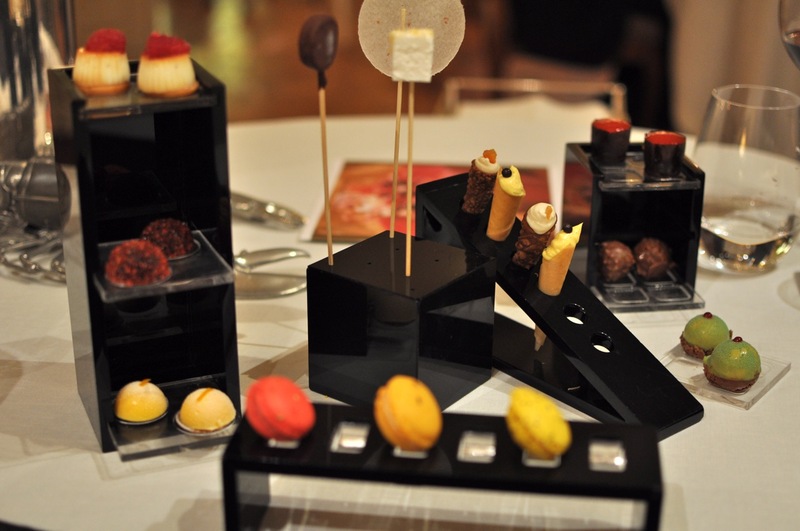 The first course of this menu was sublime, and the best of the evening. 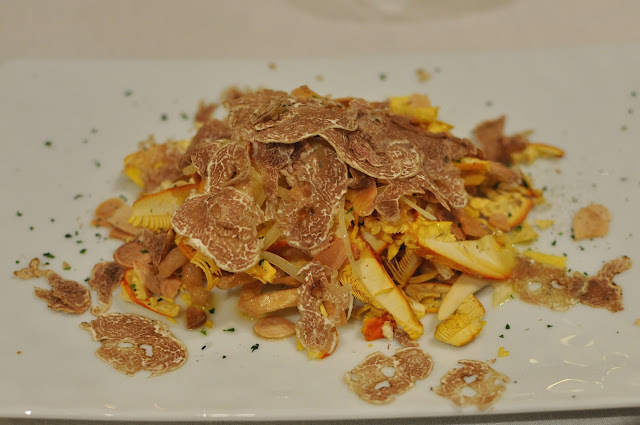 It was a salad of king mushrooms (which was almost orange in colour), roasted sliced almonds, cheese strips and olive oil, with a generous shaving of white truffles. 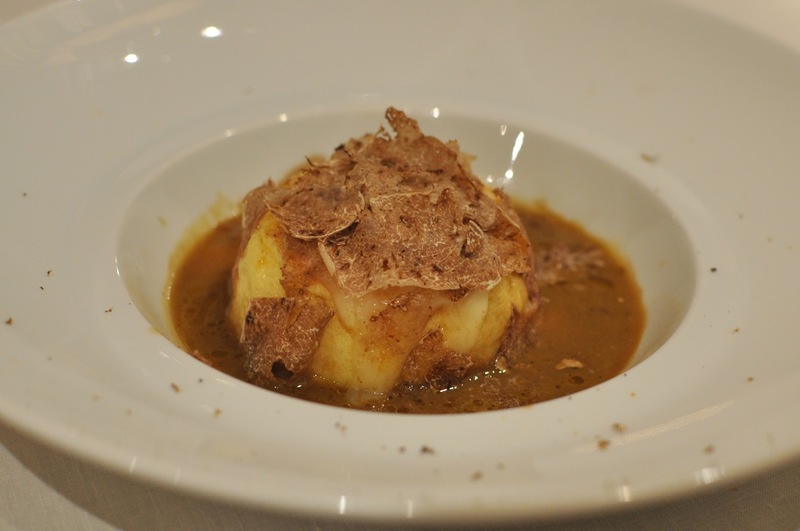 The harmony of the ingredients in this dish was amazing, and it was easily the best truffle dish we have tasted. 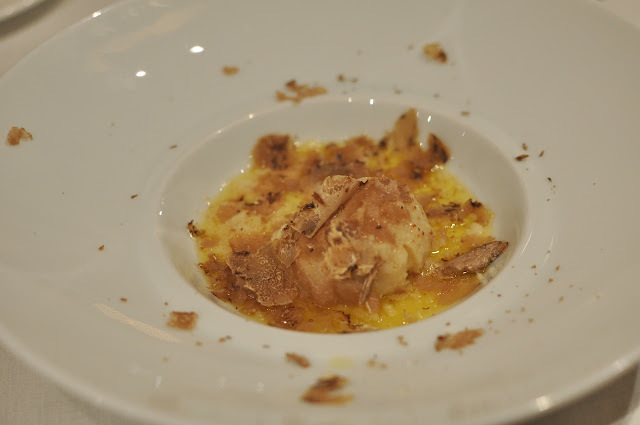 The next dish was the corn souffle (with poached egg yolk within) with melted robiola cheese from Piedmont with white truffle shavings. 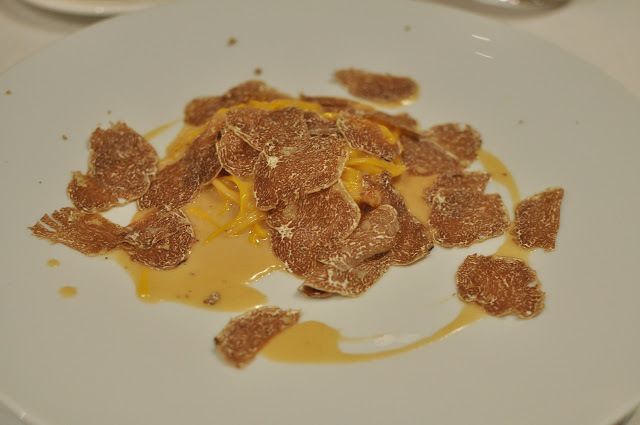 It was very good, and the egg yolk complemented the white truffles very well. 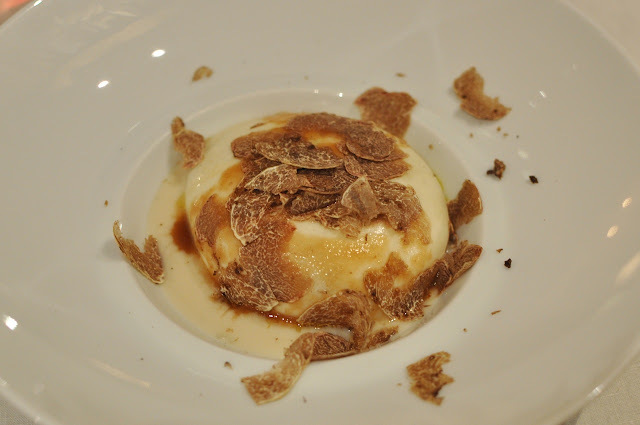 Then came a dish which looked very much like the previous one, but was quite different: the mozzarella foam encased with mozzarella skin with white truffles. This was excellent, as the texture of the cheese was both chewy (on the outside) and soft and foamy (on the inside). Another pasta dish and yet another disappointment. 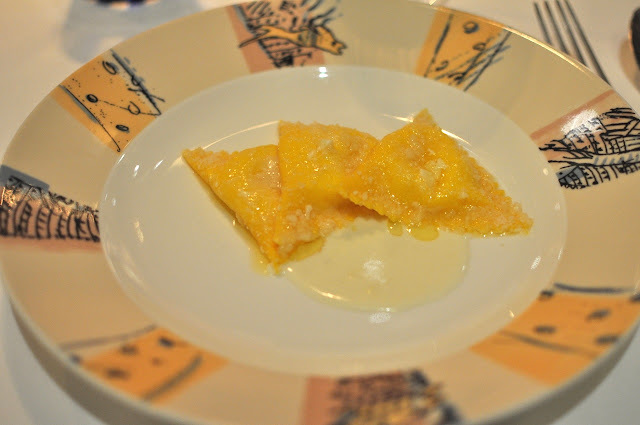 This was tagliolini pasta with cheese and egg yolk sauce with white truffles. The pasta was, as it was the previous night, overcooked and the sauce was so overpowering that it neutralised the fragrance of the truffles. After two nights of ordinary pasta, could it be that this is not this restaurant's strong suit? At this point, we were already very full on the rather starchy food we had eaten so far (all with cream, or pasta or cheese) and the next dish didn't help. It was gnocchi with white truffles. We weren't terribly impressed by it to be honest, and it served merely to fill us up even further. We were quite puzzled by the final main course. 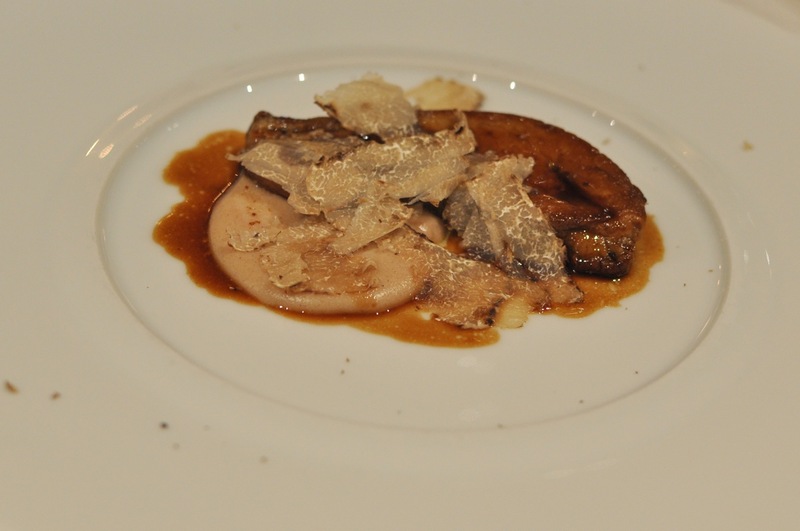 It was pan-fried foie gras with chestnut cream sauce and white truffles. The chestnut cream sauce went very nicely with the foie gras and also with the truffles, but unfortunately, the foie gras was too strong tasting and overpowered the truffles. We are not big fans of truffles shaved over red meat as both will compete to be the dominant taste, and this seemed to be the case here. 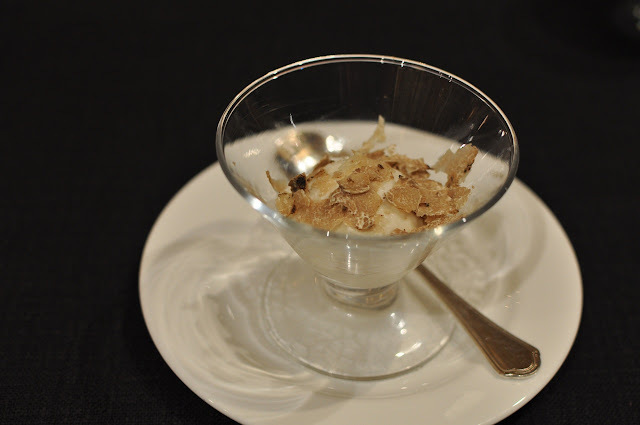 Dessert was a vanilla ice cream with shaved truffles, which was indulgent but disappointing in its simplicity; we expected the chef to come up with something more innovative with the use of truffles for dessert, and this seemed like a bit of a cop-out. 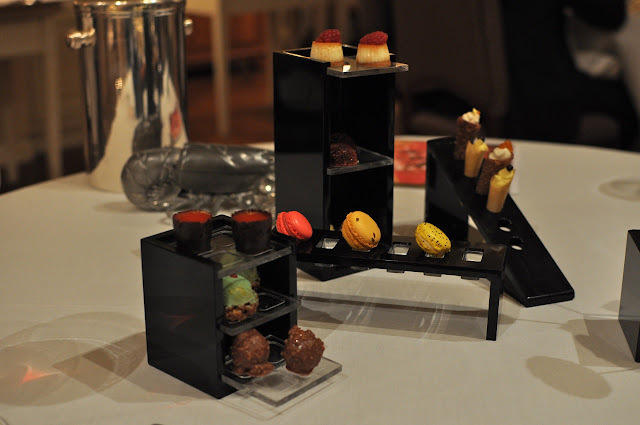 Petit four was the same as the previous night, but we were so full by that point (added to our jet lag) that we hardly touched it, and did not even bother with the sweets trolley. In conclusion, we were glad that we came for dinner the night before when we had a better dining experience. Truffle menus can sometimes be a double-edged sword; the use of white truffles can flatter the chef but can also restrict the creativity of the chef who needs to come up with more than half a dozen dishes all incorporating the truffle. From that point, we decided that for the rest of our Italy trip, we would avoid the white truffle menu but instead have the normal menu with perhaps one dish (preferably the egg dish) with the white truffles. As we were staying at the resort for 2 nights, we initially planned to have a light dinner at the restaurant on the first night (as we had just arrived in Italy that morning and was afraid that our appetite for dinner would be adversely affected by jet lag) and come back on the second night for a bigger meal. 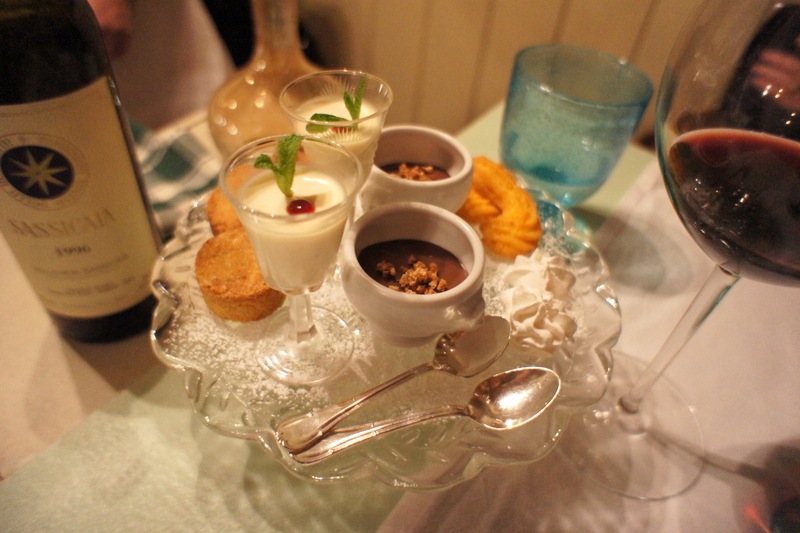 However, once we had been seated in the very formal dining room at a very nice window seat overlooking the gardens, and each served with a glass of prosecco, we forgot all about our tiredness and proceeded to order their seafood degustation menu with some relish. 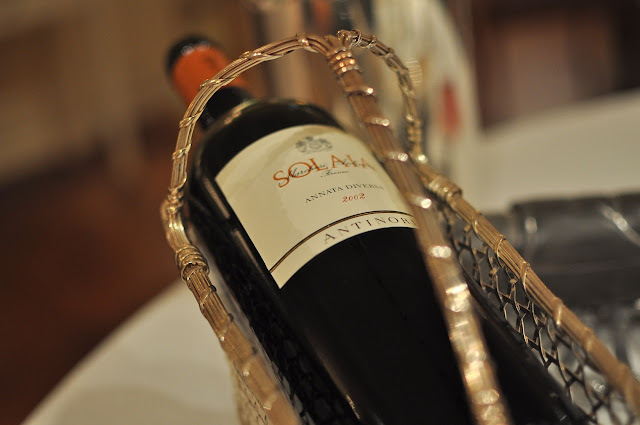 For our wine, we ordered from a very extensive wine list the 2002 Solaia. It wasn't the best year to be honest, but it was priced quite reasonably so we decided to take the chance. This super-tuscan had the unique name of 'annata diversa' because it was a rare vintage whereby the winemaker did not use the sangiovese grape (which is the mainstay of the super-tuscans) due to the weather and instead only used the cabernet sauvignon and cabernet franc grapes. Despite that, the wine was drinking very well and we thought it was very good value for money. 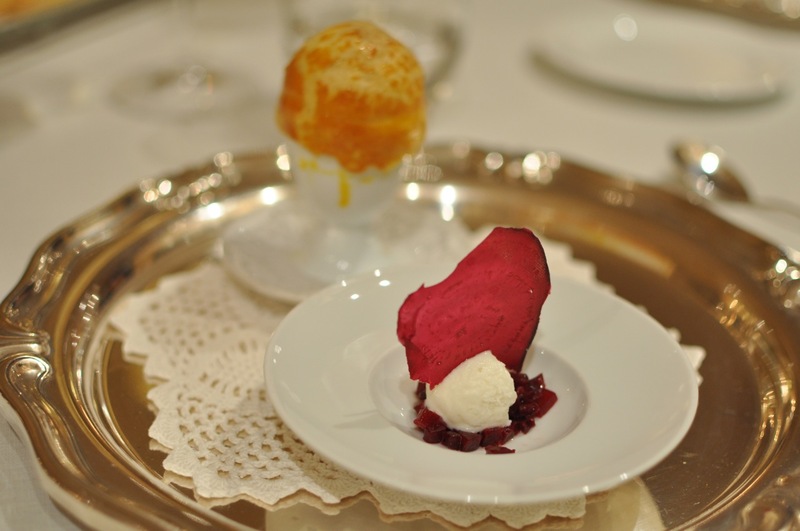 We were served an amuse bouche of mushroom soup with puff pastry and a vanilla sorbet with beetroot. 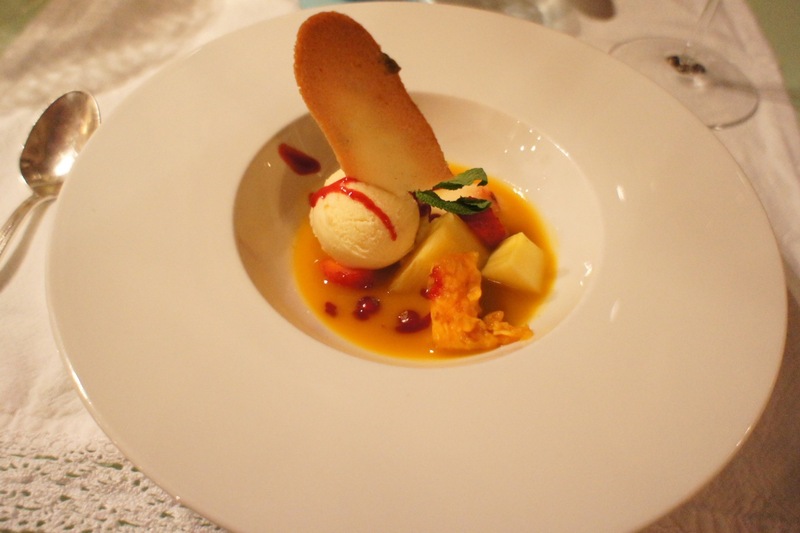 The soup was excellent and the sorbet quite good also. 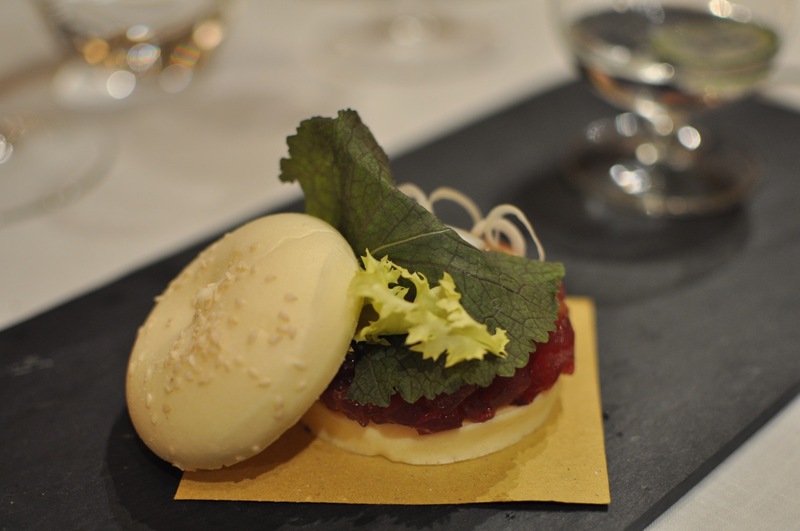 The first course of the meal was an interesting tuna tartare 'burger' with onion sauce and accompanied by a glass of gin tonic. This was very innovative: the 'burger' buns were made of meringue, and the gin tonic washed down very well the slightly fishy taste of the raw tuna. 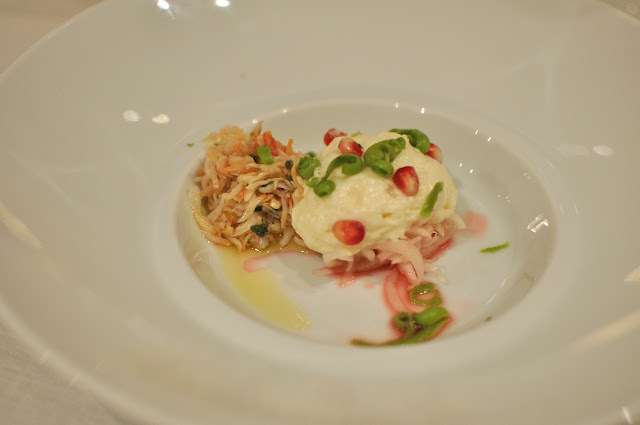 Next was the king crab with parmesan, avocado and pomegranate, which was also very good. The parmesan was very light and almost foam-like and the crunchy pomegranate pulp added a sweetness which complemented the crab meat. This was followed by the slightly disappointing linguine with tomato sauce and razor fish (this is how they described the fish, not sure what it was exactly). We felt that this was a very ordinary dish. 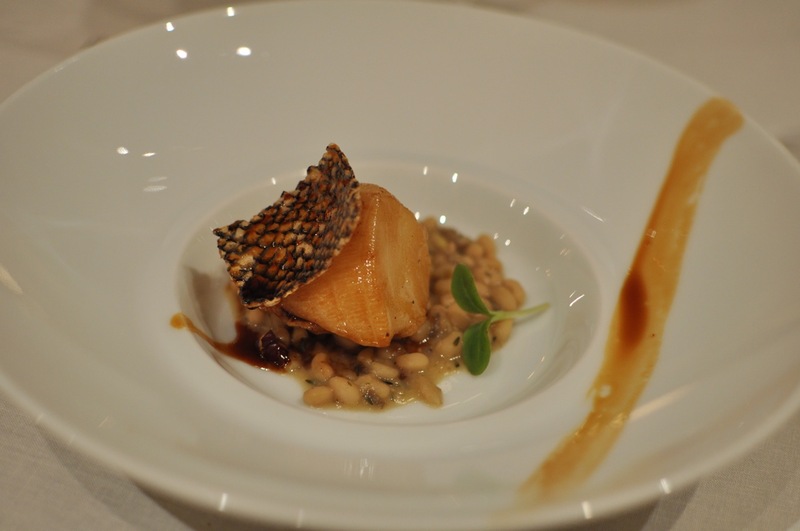 However, our faith was restored by the next dish, which was the black cod with beans from tuscany (tasted like lentils) with crispy cod skin. This was possibly the best cod we have had. The crispy skin tasted like very delicious fish crackers and the cod was both succulent and tasty. The marinate tasted a bit like miso but much richer. And finally, the chef's famous seafood platter. Many different reviews of Da Vittorio have raved about the seafood platter, and we have seen pictures of some really ridiculously massive seafood platters on other food blogs. Fortunately, the one we were served was much more manageable. This was an assortment of langoustines, prawns and calamari, which were, together with some vegetables and fruits, deep-fried tempura-style, accompanied by a yoghurt lime and prosecco sauce dip on the side. It was an excellent dish. Dessert at Italian restaurants is never going to be the grand affair that we would expect at a french restaurant, nevertheless, we expected a bit more from Da Vittorio than the rather ordinary panna cotta with raspberry puree. Fortunately, the petit four (or in this case, thirty-two) was more than adequate and elaborate to satisfy our sweet teeth. 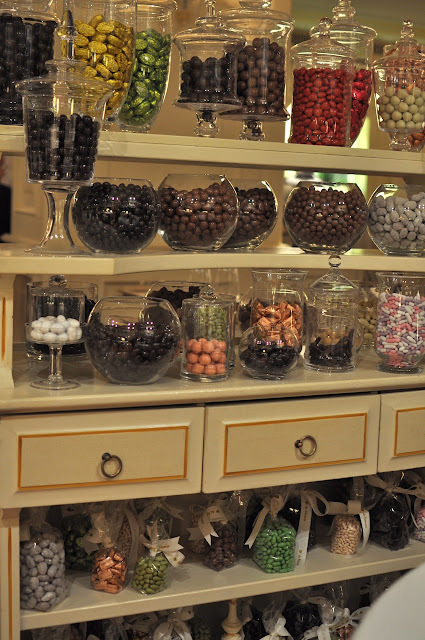 Add to that a sweets trolley, which was unique from what we have seen before as it was exclusively sweets (no pastries) ranging from chocolate, chocolate-coated coffee and chocolate-coated liquorice. During the cold months (it was low single digits in degrees Celsius in the evening when we were there), the resort sets up a bonfire outside the restaurant with seats surrounding it, for resort and restaurant guests to sit or stand around to drink their wines or smoke their cigarettes before, during or after dinner. 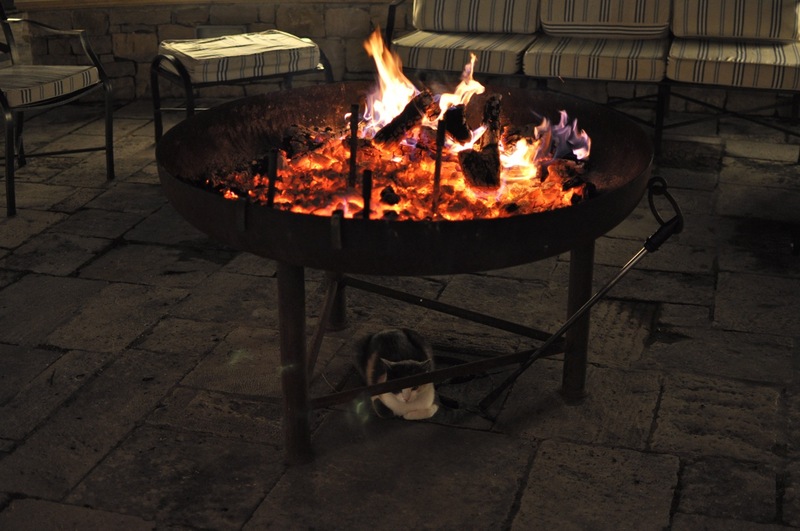 We loved to stand by the fire after a particularly filling dinner and enjoy the chilly breeze under the clear star-lit sky. The resort has a house cat which you can find every evening curled comfortable under the bonfire. 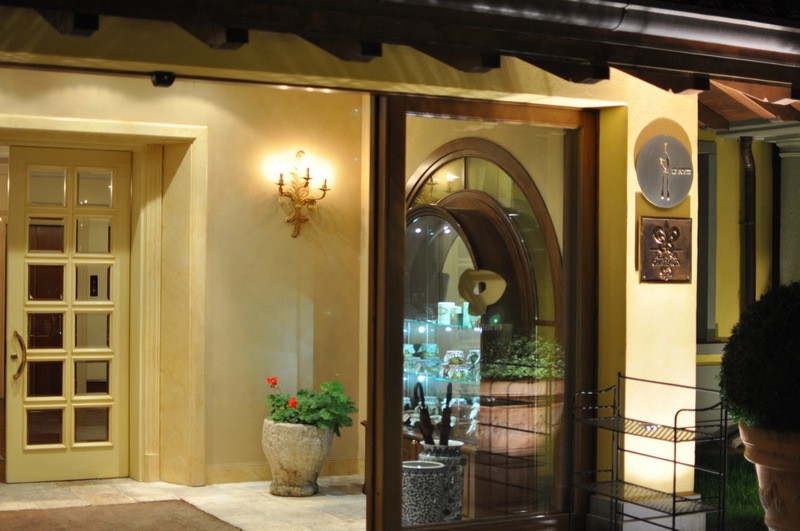 This restaurant is extremely popular and it is regularly fully booked. Most of the guests that night were from Milan, and they could bother to drive more than 1 hour (not including peak hour delays) to the restaurant and then another 1 hour back after a long dinner, on a Monday night, no less. 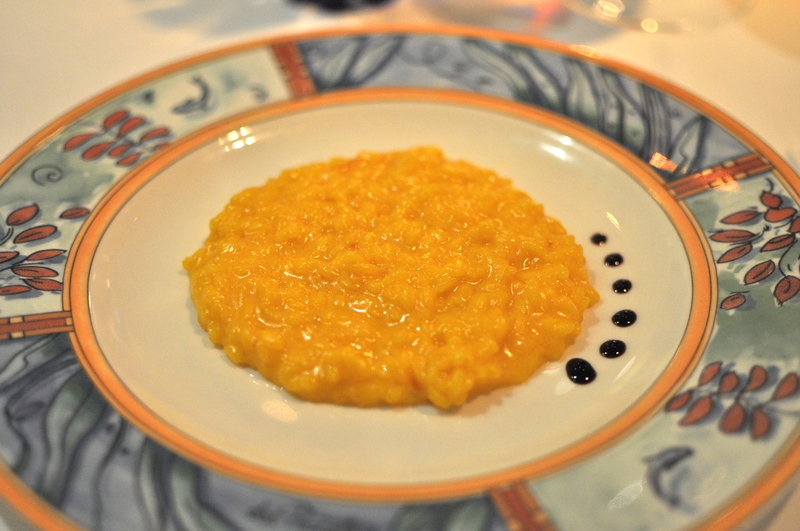 It is a testament to the quality of the food and dining experience at Da Vittorio.